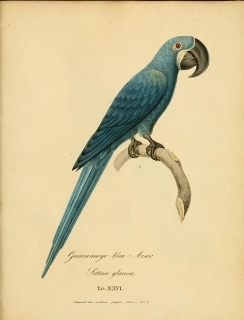 There have been only two reliable reports in the 20th century of the Glaucous Macaw in the wild - one direct observation in Uruguay in 1951 and one based on local reports in Parana in the early 1960s. Both adults green/blue, more green on underparts; grey/green tinge on head and neck; dark grey/brown throat, turning to wash on cheeks and upper breast. Bill grey/black. Eye ring bare and yellow, with paler yellow tear-drop shaped lappet at sides of lower mandible. Eye brown. Last specimen in captivity probably died in a Buenos Aries Zoo in 1938. Habitat degradation and destruction due to settlement of the major river basins. Was also hunted and captured for the wild bird trade. Formerly confined to region in middle reaches of Rio Paraguay, Rio Parana and Rio Uruguay, in SE Paraguay, NE Argentina, in Corrientes and possibly Misiones, and Rio Grande do Sul, SE Brazil; possibly also Artigas, NW Uruguay. Assumed to have been found where cliff faces were available for nesting and roosting. Also a known association with riverine habitat, and sometimes lightly wooded savanna. Fed on nuts of Butia yatay palms. Likely gregarious. Nesting reported to be in steep bank or cliff, or less often, tree cavity. One report of a nest cavity in December.